Valdese, North Carolina is a small town of 5,000 folks, about eight miles east of Morganton, out where the Blue Ridge Mountains draw a green curtain across the sky. It’s a gorgeous location, but Valdese has seen more than its fair share of municipal challenges as furniture and manufacturing jobs have moved out. Then, in 2015, a 302-acre parcel on Lake Rhodhiss, just north of town, with 2 miles of waterfront access, was sold to a Colorado Company. To purchase the property for conservation purposes would require $365,000 of private contributions and matching funds to secure Clean Water and Parks & Recreation trust fund grants to save the property for use as a public park. That’s a lot of money for a small town. But among those 5,000 residents was Beth Heile. And Beth Heile sprang into action. 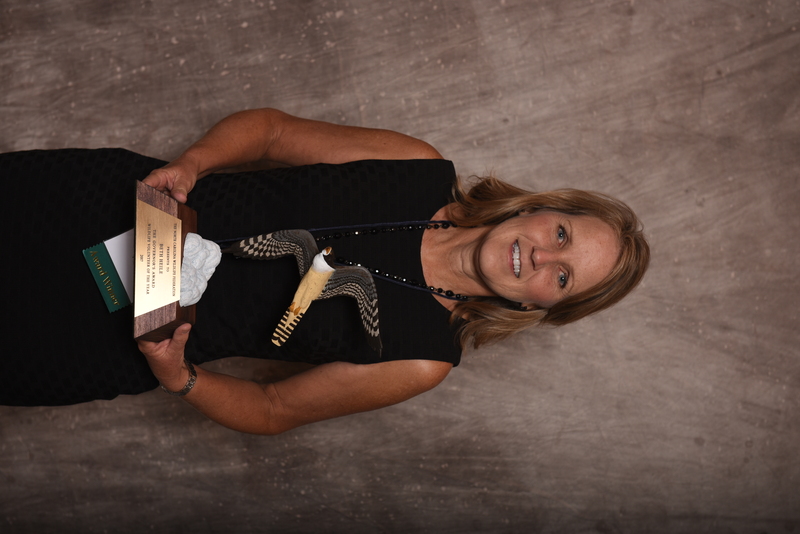 Over the next few years she founded and presided over The Friends of Valdese Rec. She spoke to countless groups and individuals. 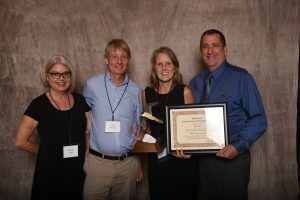 She brought in the Foothills Conservancy as a project partner. She nearly broke FaceBook with daily postings about the fund-raising effort. It took seven months, but the private and corporate citizens of Valdese understood the value of their very own park, protecting their very own water supply, and adding hiking, biking, and nature trails to a landscape they treasured. They raised the money, and today the Valdese Lake Park is both a testament to the value of wild places, and the indominatable spirit required to make big dreams a reality. It took a spark to light the fire of 5,000 Valdese residents, and Beth Heile was spark, tinder, kindling, and fuel for the effort to create the Valdese Lakeside Park. 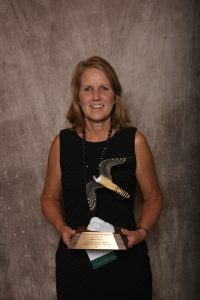 She is the Wildlife Volunteer of the Year. Beth was nominated for the awarded by Tom Kenney (pictured above, 2nd from left) with Foothills Conservancy of NC and Doug Knight with Valdese Parks and Recreation Department. 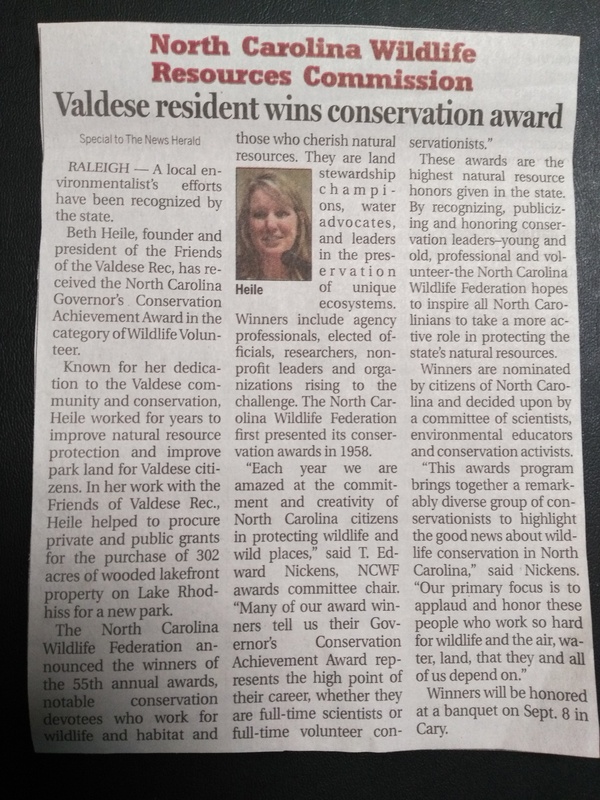 Friends of the Valdese Rec President and Founder Beth Heile has been recognized for her work. Read the Story in The News Herald. This entry was posted in Uncategorized on September 9, 2018 by Beth Heile.